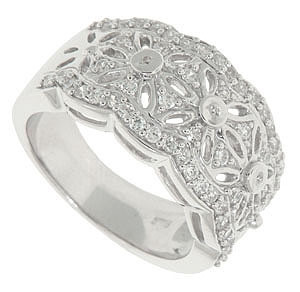 This antique style wedding band contains .67 carat total weight of diamonds. 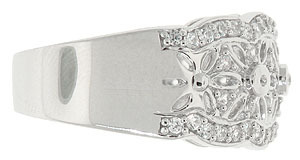 Radiant daisies are cut into the face of the wedding band. The petals of these glorious blossoms are cut out while the centers of the flowers are solid, smooth surfaces set with diamonds. Additional diamonds and decorative milgrain enrich the negative space between the blooms. 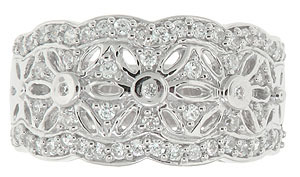 A scalloped diamond encrusted border finishes the rings' edges. The sides of the band are polished smooth. The wedding band measures 10.52 mm in width. Size 6 3/4. We can re-size. 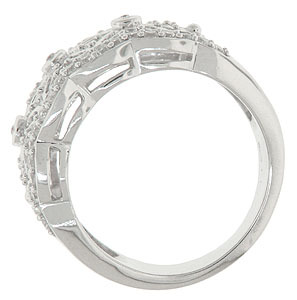 The ring can be ordered in any size and is available in 18K, yellow gold and platinum.